Very Positive (25) - 80% of the 25 user reviews in the last 30 days are positive. Mostly Positive (178) - 71% of the 178 user reviews for this game are positive. “We want to turn Chef into a great game, therefore we’ve decided to release it in Early Access to have the opportunity of developing the game while being in close contact with the community, listening to feedbacks and integrating the best ideas in our development schedule. “While the Early Access release is already featuring strong and complex management gameplay, we want to further commit to the cause of delivering a memorable tycoon game. A game like Chef can be expanded in many ways and our main goal is to deliver the ultimate restaurant tycoon experience. In the next months we’ll not only provide constant minor updates, but also enrich the game with several major features: skill-trees for the entire staff, the possibility of owning more restaurants at once, special cooking challenges with various competitors, extended management options like the possibility of having fixed price menus or advanced marketing options. A new, juicy update has gone live: we expanded the entire Policies System, adding another layer of depth and strategy to the game! You will now be able to finely tune each category of advertisement, target specific customers groups and/or drive away some of them! The update also come with a completely reworked UI, easier to use and clearly diplaying all important data! 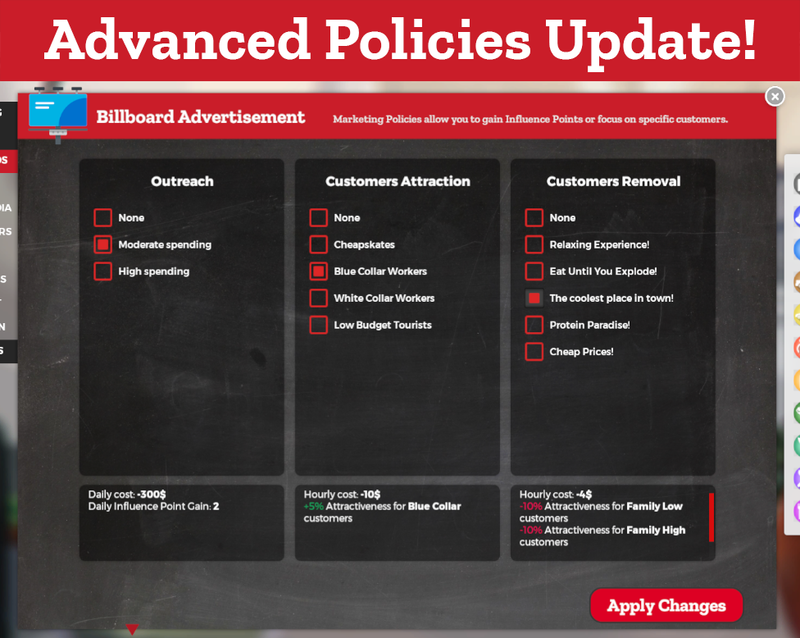 Completely reworked how Policies works, with the addition of an apply button and hourly costs. Added multiple stances to each Policy. Advanced Policies are now unlocked via events. Reworked and extended all marketing policies to allow players to both extend their influence on the map and filter desired customers. Added decision to search for new potential employees directly in the Staff Panel. Reworked the Policies UI to be clearer and better looking. Fixed an issue seeing customers seating without facing the table. Fixed an issue with the Ambience rating when moving to a new restaurant. Tutorial Images are not a little blurry anymore. Fixed a bug with policies not working properly after reloading. Today we finally released a feature many people asked in the last weeks: the Info Panels! 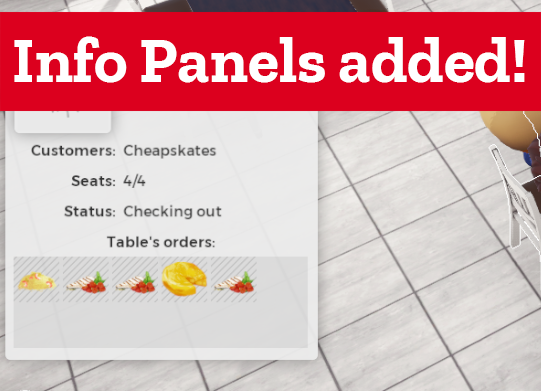 It is now possible to click on most in-game entities to learn more about what's happening in the restaurant! That will allow all you chefs to better tune your restaurant and increase your profits! We also balanced late game contents and fixed a couple issues! Added Info Panels: players can now click on in-game entities to learn more about their stats and what they are doing. Improved the visual effects on tools in use and made them closely reflect the actual number of slots used. Reduced the Popularity needed to unlock Popularity Events. Balanced the cost of all tools. Fixed the Summary Panels showing some erroneous data. Chef allows you to personally don a kitchen apron and embark on an exciting career in the wild world of professional cooking. Starting with nothing but pocket change, a small restaurant, and an ambitious dream, you’ll ascend from the life of a humble cook to that of a world-famous chef. Nothing will prevent you from deciding how to climb to the top of the food chain. Prepare yourself for a true sandbox experience in which all your management choices matter as you build your gastronomic empire. What will it be? A steakhouse? A vegan paradise? A pasta palace? An experimental cooking lab? Only you can figure out which path is best for your establishment. Hundreds of events and minor storylines will weave an emergent narrative around your choices and actions.